The script will first find all members of the TARGET_AD_GROUP. The script will then store the array of users in the variable $user. The script will then iterate over each of the users in the array. 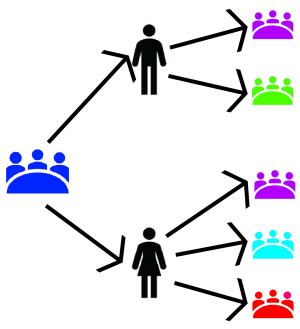 During each iteration, the script will find all groups that the current user is a member of. This resulting groups are stored in the array $groups. The script will then iterate over the groups and write out the current user and all of their group memberships to the logfile, one group at a time. You can then import the results into SQL Server, Excel, etc for pivoting and further analysis.